Remember the Touch Book from last year? 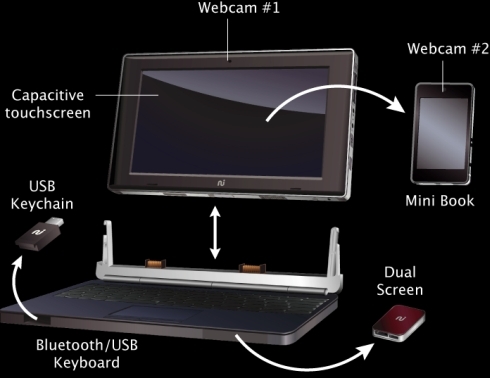 The netbook with a detachable screen that can double as a tablet? No? I didn’t either. But sure enough, we did a post on the device and it actually shipped to consumers. Well, the company is back with the next generation that takes the multipurpose theme up a notch. The Smart Book is the swiss knife of mobile devices as the demo video shows. The detachable screen is still there, but now there’s a removable mobile device that can used as a sort-of smartphone with its ability to run apps, browse the web and even place VoIP calls. Plus, the keyboard section hides a USB to HDMI for connecting to a larger screen and a slot that stores a 2GB USB dongle. An ARM Cortex-A8 CPU along with 512MB of RAM powers the device while 256MB of NAND flash storage and an 8GB microSD card provides the storage. 802.11b/g/n and Bluetooth 2.1 rounds out the connectivity options. It ships with a custom user interface but the company says it can run Ubuntu, Android and eventually Google Chrome OS. Altogether the device weighs in at 3lbs.